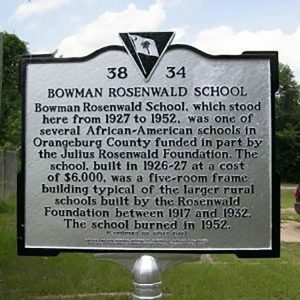 Bowman Rosenwald School, which stood here from 1927 to 1952, was one of several African American schools in Orangeburg County funded in part by the Julius Rosenwald Foundation. The five-room frame building was typical of the larger rural schools built by the Rosenwald Foundation. Bowman Rosenwald School educated about 250 students a year for most of its history, at first in grades 1-8 in a five-month session. By 1948-49, it served grades 1-12 in an eight-month session. Its enrollment grew dramatically after World War II, reaching a peak of 576 students in 1951-52, its last full school year.